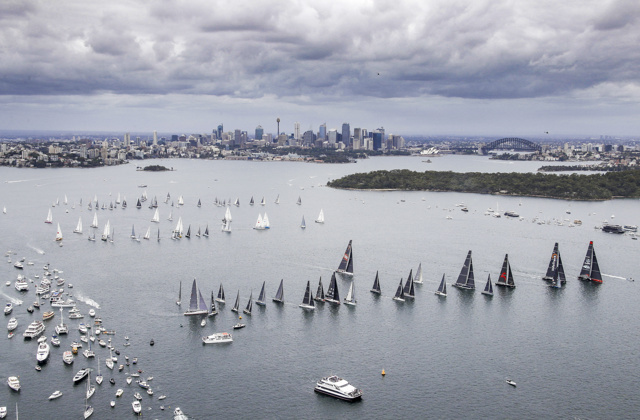 The 85-strong fleet was told by the Bureau of Meteorology at the final race briefing at the Cruising Yacht Club of Australia this morning that 10-15 knot north- easterly winds were forecast for the 1pm start on Sydney Harbour. Out the Heads, north to north easterly winds of 15-25 knots are forecast to catapult them southwards at a nice speed. However, despite a strong wind warning expected early Thursday morning, the race should become a battle of the mind and on water cunning for all crews in a race that could especially see the fight for handicap honours and the Tattersall Cup wide open to the end. “The conditions have really been slowing down for the entire fleet,” Allen said today at the docks of the CYCA. “So we’re really concerned that the transition we are going to get tomorrow and the 28th is really going to slow the whole fleet down. “We might be the favourite with the odds, but I think it’s really wide open for the overall winner of this year’s race. “It is going to be really hard work. Tonight will be really fast. It will slow down eventually, but through the course of tomorrow, it’s going to be about people avoiding the areas of no wind. “There’s going to be lots of areas of no wind on this race track right across the whole fleet. “It’s going to be (about) trying to keep the boats moving through the early hours of the morning right across the 27th and 28th. “I think the leader board is going to change a lot through the course of this race. “The conditions are changing a lot, so any plans we’ve got now are going to change through the course of the race. “It’s a real tactician’s strategy race, apart from this afternoon where it will be champagne sailing for a few hours there. Dave Witt, the skipper of Hong Kong entrant Scallywag, one of five super maxis in the race, concurred, saying the forecast was “not challenging at all, but technically challenging. “(There are) no real hazards. The transition on the night of the 27th will probably decide the race. You ‘gotta’ make sure you are good shape by the night of the 27th,” Witt said. Stacey Jackson, skipper of the all- professional female crew of Wild Oats X, believes the race will be a “tricky” one. Former Foreign Affairs Minister Julie Bishop MP will also be on board Wild Oats X for the start as an ambassador for the crew’s campaign for ocean sustainability. She will disembark by jumping off the boat when it is in clear, safe water, most probably off Bondi Beach. “The forecast has changed a little bit over the last couple of days,” Jackson said. “It is kind of soft conditions, which isn’t bad for Wild Oats X. A skinny boat is going to enjoy those sort of conditions. “The tricky bit will be arriving into Hobart and up the Derwent (River) where it will be particularly light. Bishop said she was prepared for her exit from Wild Oats X. “I have been through this time and time again, particularly the bit where I have to jump off as we turn right and head down to Hobart. About Bondi Beach I think is where I disembark,” she said. Pressed on what an all female crew brings to the Sydney Hobart, she said: “We are actually promoting two causes, not only the participation of women in sport, showing that women can compete with the best. We are also focusing on ocean sustainability and we are really concerned about plastic pollution in the oceans. “So this is an opportunity not only to focus on a female crew, but for the cause that we are advocating, and that is to clean up out oceans. Iain Murray, strategist on Wild Oats XI, another one of the five super maxis and a record eight times winner on line honours, said the atmosphere of the crew was relaxed heading into the start. “I think it looks such a benign race I think the crew are relaxed,” said Murray for whom this will be his 25th Sydney Hobart. “When you get a forecast of a lot of wind and huge waves in Bass Strait and all of that it is a bit twitchy but it looks like a fairly calm passage across Bass Strait. Asked what are the hazards of the forecast, Murray said: “The real issue is linking all the bits of wind up, and there will be light spots and sports where there is not much wind. Asked which boat he believe will be the biggest threat for Wild Oats XI, Murray tipped Comanche that won line honours last year, but on protest after Wild Oats XI was penalised an hour after crossing the line in Hobart first for an incident with Comanche at the start. “I would expect Comanche to charge off after the start like we often see, particularly in the stronger nor-easter going on to the north,” Murray said.